Nerevar's early life is only known through myth. Ashlanders of Vvardenfell remembered him as an outlander. Vivec's prose suggests Nerevar was once a protector for a merchant caravan, and he met Almalexia when she was already a ruler and Vivec was still in the womb. Between 1E 240 and 1E 272, the Nords of Skyrim used their armies and the power of the thu'um to take over the whole of Resdayn. When the War of Succession began in 1E 369 and left the Nords crippled, Nerevar decided to seize the opportunity for rebellion. "General" Nerevar united the many disparate factions of the Chimer people and became their Hortator, their collective military leader. The alliance he forged with the Dwemer was crucial for his people, as the Nords had never been able to conquer the mighty underground Dwemeri cities (the Dwemer had essentially stayed independent despite the Nordic invasion). The alliance depended on his personal friendship with their leader King Dumac, because though the two were "blood friends", the people they represented generally despised each other. Together, they decisively repulsed the Nords in 1E 416 at the first Battle of Red Mountain, and their alliance survived for centuries. Dumac even came to Nerevar's wedding to Almalexia, and presented the new couple with the swords Hopesfire and Trueflame as wedding gifts. Trueflame went to Nerevar, and was also known as the Blade of Nerevar. Nerevar and Dumac attended the coronation of Emperor Gorieus together in 1E 461 as representatives of Resdayn. At the time, Sotha Sil was Nerevar's teacher and one of his closest advisers. Nerevar's junior counselor and other teacher was Vivec, and Sotha Sil acted as a mentor for them both. Voryn Dagoth, who was roughly the same age as Nerevar, was the Lord High Councilor of House Dagoth (and, by some accounts, Nerevar's most loyal servant). Nerevar's shield-companion was Alandro Sul, who was known as the immortal son of Azura. Several legends hold that Nerevar was Azura's champion, and the two had a special relationship. He consulted Azura on important matters, and it was she who blessed his ring Moon-and-Star, a unique ring made by Dwemeri smiths before the First Council was formed, so that it would kill any who wore it except Nerevar. It was on this ring that Nerevar swore to the Ashlander tribes that he would always honor their way of life, and thus earned their allegiance. The ring also gave him great powers of persuasion. The moon and star was heavily associated with Nerevar. Legend says his family standard bore the moon and star, and Nerevar's armor and weapons bore this sign. Some say he bore a moon-and-star birthmark. Others say he was born under a moon-and-star. It was during this era of peace and prosperity under the First Council that many of The 36 Lessons of Vivec take place. Vivec's Lessons recount many unbelievable tales about Nerevar and himself, such as that they journeyed all over northern parts of the world together (including Akavir, Yokuda, and Atmora), that he taught Nerevar CHIM, and that Nerevar tried to reach heaven by violence, fighting the "Parliament of Craters" on the "first moon" and journeying to the library of the sun only to be defeated by the power of Magnus. Through means lost to history, Voryn Dagoth learned of the Dwemer High Craftlord Kagrenac's plan to secretly exploit the Dwemer's discovery, the Heart of Lorkhan, which the Chimer would not have tolerated, considering it blasphemous. Dagoth told Nerevar of this plan, and when Nerevar confronted his friend Dumac about it, relations broke down. Some sources suggest that the whole matter may have been the result of a misunderstanding, as Dumac may not have known about Kagrenac's plan until it was too late. At the outset, Nerevar had to once again convince the Chimer factions to band together under his leadership. Dwemeri technology undoubtedly made them the most fearsome military force on Tamriel, and though the Chimer were skilled in fighting and magic, they suffered numerous defeats in northern Resdayn until they finally once again united under Nerevar. It is unknown just how long the war dragged on, but through strategy, trickery, and the judicious use of Ashlander scouts, Nerevar orchestrated another climactic confrontation at Red Mountain. The battle would ultimately be another decisive victory for the Chimer, even though it would claim many lives, including Nerevar's. 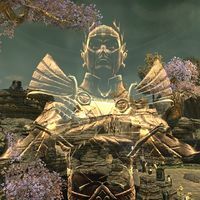 The Heirographa, the orthodox teachings of the Tribunal Temple, held that Nerevar, with the help of Azura and the Tribunal, utilized the Heart of Lorkhan to make the Dwemer disappear. 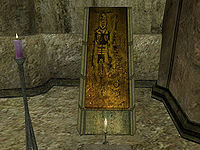 Some Ashlander accounts corroborate that Nerevar and Azura made the Dwemer disappear, but generally hold that the Dwemer destroyed themselves. Sources conflict on many other aspects of the war, in particular the role of House Dagoth and whether Voryn Dagoth remained loyal to Nerevar. How Nerevar died at the Battle of Red Mountain is one of the most disputed topics in history. His sword Trueflame was shattered in the fighting, and its pieces were lost. The Nords say Nerevar was mortally wounded by Lorkhan, and then feigned death in order to cut out Lorkhan's Heart and defeat the God of Mortals once more. Vivec gives his own account of the events leading up to and during the battle. He glosses over how Nerevar actually met his demise, but implies that Nerevar died of wounds he received at the end of the battle from Dumac and possibly Dagoth Ur. Ashlanders believe that the Tribunal, greedy for the power of the Heart, poisoned a wounded Nerevar so he would not interfere with their plans for the Heart. They trace their beliefs to the allegations of Alandro Sul, who had reportedly been blinded during the battle and went to live with the Ashlanders afterwards. At some time soon after the climax of the battle, following the disappearance of the Dwemer, Nerevar insisted that he, Almalexia, Sotha Sil, and Vivec swear upon and before Azura never to employ the Tools of Kagrenac in the profane manner that the Dwemer had intended. A few years after the battle, when the Tribunal broke their oath to Nerevar and used Kagrenac's Tools to seize divine power, Azura appeared and cursed them. She assured them that her champion Nerevar would return to punish them for their perfidy, and to make sure such profane knowledge might never again be used to mock and defy the will of the gods. When Sotha Sil dismissed her claims, all Chimer were changed into Dunmer, and she professed that all the Dunmer would share the fate of the Tribunal until the end of time. Nerevar's wife Almalexia later became the Consort of her fellow Tribune Vivec. The Heirographa claimed that he lived long enough to bless the new Tribunal as protectors of his people. The disagreement over Nerevar's death created a schism between the Great Houses, who accepted the Tribunal as their new living gods, and the Ashlanders, who decried the Tribunal as murderers. It was not until the early Fourth Era, when worship of the Tribunal faded, that other Dunmer would come to appreciate the Ashlanders again for preserving the ancient traditions Nerevar had promised to respect. Many people, notably Dagoth Ur and his followers, recognized no distinction between Nerevar and the Nerevarine. ^ a b Almalexia's dialogue in Tribunal. ^ a b c Vivec's dialogue in Morrowind. ^ Nibani Maesa's dialogue in Morrowind. This page was last modified on 7 March 2019, at 00:08.